In a 2010 piece written for Information Standards Quarterly, I suggested that ebooks may, at least in the near future, remain the elusive next big thing they have promised to be for over a decade. A year on, I am surprised to see that the latest round of ebook-boosterism started by the Kindle and taken to fever pitch by the iPad has not abated. One could debate how much our reading habits have actually changed, but simply based on the hardware sales, clearly some people are making the switch and finding it worthwhile. As the saying goes, however, a picture can say a thousand words, and this rather odd and somewhat unattractive ad from the back of a recent New Yorker indeed speaks volumes about ebooks. 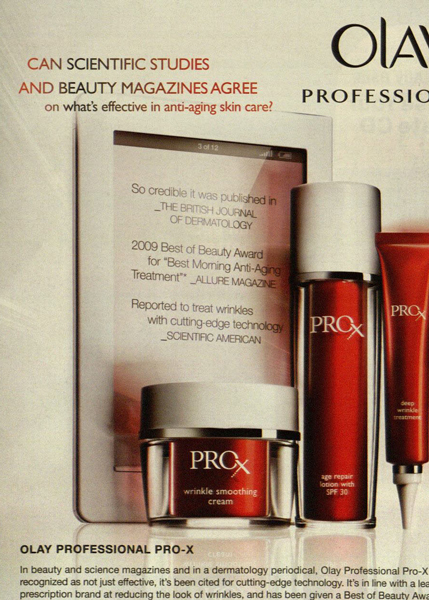 When an ebook reader–sort of a photoshopped Kindle/Nook hybrid–shows up as a prop in an Olay cosmetics ad, well, something is clearly afoot with ebooks. The funny thing about this ad is that what the ebook reader is ostensibly doing here, namely, showing research results, is something that most ebook readers cannot really do as yet, other than perhaps the iPad. The scholarly journal information delivered nearly exclusively in PDF form does not play well on most ebook readers, as Lisa Carlucci Thomas pointed out in her 2009 LITA presentation. She showed that other than the iPod touch, which could display 84% of Yale’s available ebooks, readers generally display less than 24%. She was writing of ebooks, but in this case, much the same could be shown with journals. If one has a Web-enabled device that can display a PDF via HTTP, such as an iPod Touch, any smartphone, or a tablet of some sort, then it is trivially easy to view online journal content. The problem is that the devices that lack a true Web browser–Nook, Amazon, Sony, et al.–will fail more often than not, and transferring PDFs via USB is something only a truly dedicated Kindle-lover would consider. Perhaps I was wrong that the latest ebook hype was another passing fad, as it was in the past (although it is too soon to say), but the prediction that the iPad and its peers would wipe out the single function readers such as the Kindles and Nooks appears to be a safer bet. It seems that the Kindle and similar monofunctional readers are built around an antiquated notion of reading, i.e.- reading is an isolated act, one does nothing but read when reading, as silly and tautological as that sounds. But I “read” like most people read these days, toggling between email, phone calls, Web searches, videos, music, and so forth. So, there is reading and “reading,” and it would seem that most of us are “readers” these days. Which are you? I am a reader who got a Kindle for Christmas and LOVE it. I read as much as I can, and I can say that my reading in the month of December doubled in the one week I had the Kindle. January will probably triple. Why not a tablet? Price, for one. Use, for another. I want a reader that feels good to hold. I want to read for an hour at a time, or for 5 minutes while my child is in the bathtub and I can sit (and not use that 5 minutes waiting for it to start and then get to my app, etc.). I have charged it only once while I have had it (not counting the initial charge up when opened). A tablet is heavier, bulkier. The Kindle has a sleek back with little ridges where your fingers go. It doesn’t hurt my eyes. I am not going to do a review for the Kindle, but those are the reasons I chose an ebook reader rather than a multiuse tablet. Is there downsides? Of course. My local public library’s ebooks are not able to be used on the Kindle (though I found some software that might help). I knew that going in, and still chose the ebook reader. I really don’t like DRM, like you, but for now I am willing to be a slave to it for the Kindle. Not so much for Apple’s iPad or iPod. All I can say, if you have not spent quality time with one, I suggest you do. It is specialized, but that’s why I like it. I want something that is made to do one function very well, not something that does all things just OK. If they would open up to all formats of ebooks, I might actually die and go to heaven. Or become a hermit and never leave my house.